A recent survey disclosed that 68% of customers who have a bad experience with a company post their stories on social networks. If just Facebook is used, and the average Facebook user has 229 friends, thousands will be reached instantly. 60% of those surveyed also stated that they are influenced by what others say about businesses. Couple the above information with another survey from RightNow Technologies. 86% of adults in the U.S. will pay more if customer service is good and 73% said that good customer service kept them with a brand long-term. 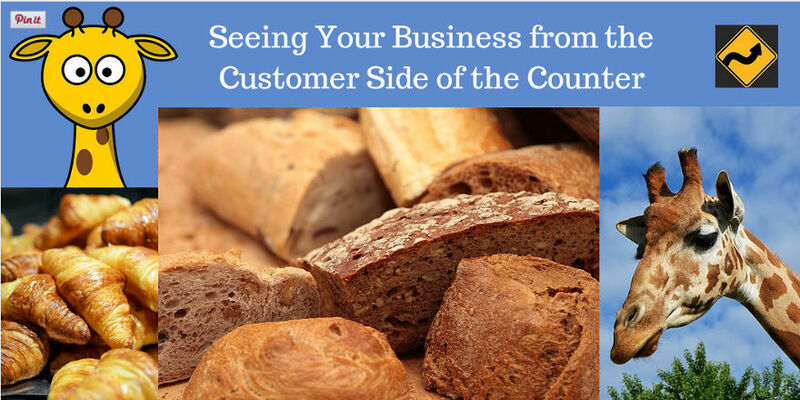 Seeing your business from the other side certainly means understanding your customer’s experience in the purchase and after-purchase phases of a sale. It also means leveraging the customer perspective far before the purchase, so that the prospect actually becomes a customer. These are the two aspects of seeing yourself through the customer’s eyes. Let’s take a look at each one. When you really know your customer, then you know that customer’s perspective on a lot of things. You have created a persona, and you understand the needs, pain points, and questions they have. These are their perspectives – not yours. And it is from those perspectives that you must make contact and connect, long before that target considers a purchase. Here are 4 ways you can engage and connect through the customer’s eyes. If you sound like everyone else, then you are really saying that the product or service you offer is just like everyone else’s too. With nothing to differentiate you, the potential customer may just randomly select any company for a purchase. Your goal is to know what your customer wants and needs and to provide it – not with a product, but with information, entertainment and inspiration. When you really know your target audience, you can plan content to make him/her feel understood. You know, for example, that millennials have a lot of student loan debt. Now, your product may not have anything to do with easing the pain of that debt, but you certainly can find information on re-financing and loan forgiveness and provide it in a post. You also know that millennials are staying single longer and that social life is important to them. What entertaining posts can you devise? Jack Daniels has created a great engagement with this generation with its contests for the weirdest bar stories and jokes. This is how you “connect;” this is how your target comes to believe that s/he is important to you, rather than just a sale. Again, this should be a “no-brainer,” but many businesses spin their wheels just promoting stuff all over the web, on every social media platform there is. They begin to look silly. Find the niche platforms where your customers are and stick to those. If you do your promoting really well on just 2-3 platforms, you will spread your brand more effectively. And when you do post on social media, use the language and jargon of your customer, not yours. In 1990, Coors Beer decided to get into the bottled water rage. They came out with “Rocky Mountain Bottled Water.” As it turned out, their customers only wanted beer. The new product was a total flop. This was a prime example of a company doing what it wanted to do, rather than doing some real research and learning if this was something its customers wanted. If the “big boys” can make these kinds of mistakes, so can you. ModCloth, a young adult female clothing retailer never misses an opportunity to create a buzz among its customers and future customers. It engages them with every social media post – on Facebook, Twitter and Instagram. New clothing items must all have a name, and there are contests to name this new dress or new pair of shoes. The customer with the winning name wins the item. When the owners go on buying trips, they post photos of clothing they are considering and ask for yea or nay votes. They feature their own customers as models. You have to find ways to create a buzz and keep that buzz going. If your product does not lend itself to buzz, then create another “newsworthy” activity. How about taking up a popular cause and donating a small percentage of sales to that cause. Even the cause administrators will get in on that one and give you free publicity. And everyone in their community has communities too. How grumpy do you get when you sit on hold for 45 minutes because you Wi-Fi has gone out? Pretty grumpy. Unfortunately, there are only a few options for service. A customer may have many options for your product or service, however, so the customer experience is critical. Here are 5 things that will show the customer you see things from his/her perspective. The average response time for an email sent from a customer to one of the top 100 web-based retail companies, is about 17 hours. You can do better and must make it a goal to do so. And when there is an issue, go beyond just resolving it. Do something extra. That word will be spread for sure. You ship the wrong item; you accepted an order and failed to tell the customer that you were currently out of the product and thus delivery will be delayed. A lot of smaller retailers do this, because they know that it is a hassle for the customer to cancel an order, get the refund, and then look somewhere else. When you realize this type of mistake, fix it immediately. One retailer found the product at a competitor, ordered it, and had it directly shipped to the customer. When the customer found out what the retailer had done, she “blew up” the story all over Facebook – great publicity and more customers in the future. 3) Get to know your customers. Keep a record of your communications with them. Set a goal of every employee sending out 10 personalized emails a day, based upon that customer’s specific experience with the company. They only need to be a few sentences, but it is that personalization that matters. And always ask for feedback on customer experiences. Better to have the negative feedback come to you and you resolve it with a phone call than to have it plastered all over social media. A number of years ago, a young child wrote a letter to a UK grocery store. She wanted to know why their brand of bread was called “tiger bread,” because she thought “giraffe bread” would be better. The store changed the name of the bread – the publicity all over the news media was pretty astounding. Happy customers do a lot of your marketing for you. Every “feel good” experience that a customer has means referrals to you. And every “feel bad” experience means that you will be “trashed” on social media. Every customer has a community that you may not be able to tap into, and when they understand that they are more than just a “sale” to you, they will come back, and their friends will too. This is how you build and grow. Seeing your business through the eyes of your customers and prospective customers is what marketing is all about today. We live in a customer-driven world today and leaving those customers on the table to be picked up by a competitor is just not where you want to be. Ethan Dunwill is entrepreneur and blogger who currently resides in Hong Kong. He primarily writes about marketing and business consulting. You can connect with Ethan on Medium or through his blog,Twitter or Facebook links. Customer is the most important person in a business. A business that has taken one sided decisions always have failed and thus lets give priority to our customers in our business. thanks for your tips, are of great importance for us readers, I think it’s one of the best idea to get more customers. You got great tips here but what i like the most is “Make Your Content Unique” , for me this is the most important, to be unique , especially in online business. You should always be Younique , you must have something that separates you from other business out there. Very genuine details from the customer point of view. Thanks for this post. It is very important that we have to be in touch with our client regularly and we have to show our work skills to attract them. Its an inspiring post, each point is very important and thanks for explaining each point about unique content, Promotion of content, Customer relation and response in so detail. Its true that we have to consider customers point of view and we have to be very instant in rectifying and recovering our mistakes.. Regular commutation is the best practice to growth your business. I like you blog sharing for a good business person. One way you can connect to your customers and make your brand standout is to put yourself in your customers’ shoes. You can also win your customer’s loyalty by offering a responsive customer support. Thank you for your feedback, I really appreciate it and I completely agree with your statement about customer support and stepping into your customer’s shoes. Its really a great idea to think as customer or client. I think its one of the best idea to get more clients.